It started with Henry. My grandfather. Poppa we called him. He was a farmer in the foothills of North Carolina. He grew various grains and raised beef cattle on his and my grandmother’s 90 acre farm pictured above. I’d like to tell you that I’m a 3rd generation farmer and it runs in the family but that’s not the case. Neither of my parents were remotely interested in farming. And God didn’t lead me there until this year. But now that I’m here I feel like I’m home and wouldn’t trade this life for anything. The name Oxford Creek pays homage to Henry. He lived on Oxford School Road and there is a big creek that runs through the back of the property. I’m sure he never would have thought I’d be sharing his love of working the land. I never thought it either. God is funny sometimes. Prior to God really implanting this desire in my heart to farm I dabbled in gardening. I grew 3 green beans and remember cutting them up to feed the 5 of us. That was funny. I’ve come quite a way since that dinner. This year we grew tomatoes, zucchini, yellow squash, several varieties of pepppers, kale, collards, broccoli, cucumbers, several types of lettuce, peas, brusssel sprouts, leeks, sweet potatoes, spinach, cabbage, strawberries, raspberries, blueberries and my herb garden that contained basil, cilantro, oregano, thyme, sage and chives. My hubby and I spent a good portion of the late winter/early Spring building our chicken coop where we now have 16 chickens. We overbuilt a bit. Apparently we could house 60 chickens! Who knew? This year has also brought a love of carpentry. 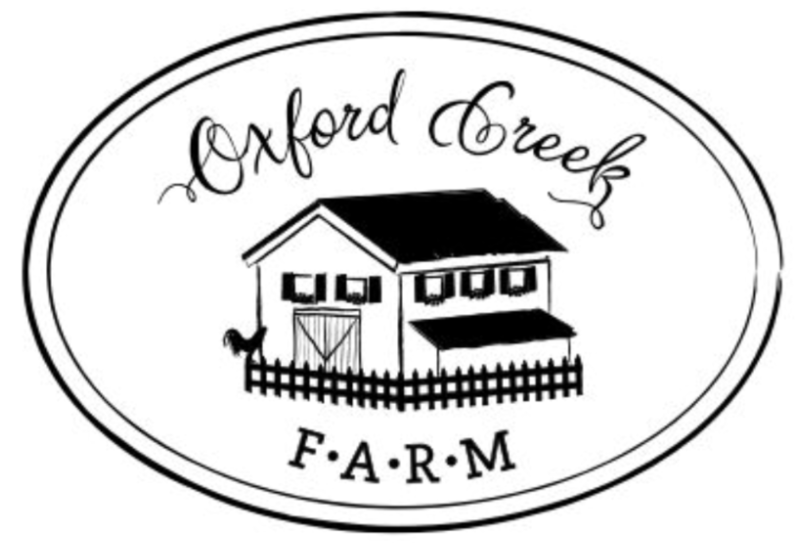 The Woodshop at Oxford Creek was born and has seen many a barn door, kitchen table and headboard created. There is something about starting with a few 2x4s and ending up with a beautiful piece of furniture. So I hope you stick around and get to know our farm and our family. I’ll be sharing the goings-on at our homestead as well as some of my favorite recipes from all that homegrown food. Beautiful! So happy you’ve found a lifestyle you love. I was raised with a family farm, hogs, cattle and chickens too. We had s huge garden that fed us year round as well. You make me want to go back girl! Carry on sister.